The Brainstem Imaging Lab aims to develop in living humans a neuroimaging-based atlas and connectivity diagram of brainstem nuclei by the use of dedicated MRI pulse sequences and scanners. Our ultimate goal is to enhance our knowledge and the quality of patient care in a vast array of brainstem-related disorders, such as disorders of consciousness, sleep disorders, vestibular disorders, autonomic dysfunction, and movement disorders (such as Parkinson’s disease). Left) 3D rendering of our brainstem nuclei atlas. Right) Example delineation of the left (blue) and right (red-yellow) pedunculotegmental (PTg, also called pedunculopontine) nucleus and pontine reticular formation oral part (PnO, also called points oralis). The PTg and PnO are islands of hypointensity in the diffusion fractional anisotropy (FA) and the T2weighted (T2w) 7 Tesla image, respectively (Bianciardi et al., 2015; 2017). We developed an in vivo 7 Tesla multi-contrast procedure able to segment on a single-subject basis 16 brainstem and 4 diencephalic nuclei crucial for arousal, autonomic and sensory-motor functions. Further, we created a probabilistic structural atlas of these nuclei in stereotaxic (MNI) space by computing the spatial overlap across subjects of the single-subject nuclei segmentations (Bianciardi et al., Brain Connect 2015; Bianciardi et al., Neuroimage 2017, Strong et al., ISMRM 2018, see Figure above). Out atlas can be used in conventional (e.g. 3 Tesla) research and clinical MRI studies to investigate brainstem mechanisms in health and brainstem-related disorders. We are currently expanding the atlas to include additional brainstem nuclei by the use of sub-millimiter spatial resolution and additional image contrasts. You have a 3 Tesla scanner, and you wonder where tiny raphe (or other brainstem) nuclei are in your images? You could consider using our in vivo probabilistic atlas of brainstem nuclei! Upon the release of our atlas (to be announced), you will be able to locate several brainstem nuclei (see list below) in your images by precisely aligning your 3 Tesla images to stereotaxic (MNI) space (i.e. the brainstem atlas space). 15) Inferior Colliculus; 16) Superior Colliculus. 3) Lateral Geniculate nucleus; 4) Medial Geniculate nucleus. Functional connectivity diagram (“connectome”) of the median raphe, periaqueductal gray, substantia nigra subregion 1 (compatible with pars compacta) with 155 target cortical & subcortical regions. These connectomes were derived from 1.1mm-isotropic resolution whole brain resting-state fMRI at 7 Tesla, and expand previous connectivity diagrams to include brainstem nuclei as seed & target regions (Bianciardi et al., 2016). Imaging of the connectivity pathways of brainstem nuclei in living humans is an underserved area of human brain imaging research. Most of our knowledge about brainstem pathways derives from tracing and MRI studies in animals and ex vivo humans. To fill this gap, we are evaluating the functional and structural connectivity of brainstem nuclei with the rest of the brain. To do so, we exploit the increased sensitivity, spatial resolution and contrast of 7 Tesla MRI scanners and of our 3 Tesla “Connectome” scanner to acquire cutting edge resting state functional MRI and diffusion based MRI. After mapping our brainstem nuclei atlas to single-subject MRI data (via precise image coregistration), we are able to build connectivity diagrams (connectomes) of brainstem nuclei with target cortical and subcortical regions (Bianciardi et al., MAGMA 2016, see Figure above). To aid the interpretation of these connectomes, we are also building prediction models of brainstem networks (Satpute et al., Neurosci Lett 2018), which include the nodes and pathways expected from previous animal and ex vivo human studies. Left) Proof-of-concept clinical use of our brainstem nuclei atlas is demonstrated by mapping the atlas to 3 Tesla susceptibility weighted images of a traumatic coma patient (Bianciardi et al., 2015), with brainstem microbleeds precisely localized to specific brainstem nuclei involved in arousal (dorsal raphe: red; median raphe: cyan), as well as in the left and right substantia nigra subregion 1 (blue, green). Right) Application of the brainstem nuclei atlas to evaluate a premotor model of Parkinson’s disease, REM-sleep behavior disorder: 70% of patients showed microstructural changes (in T1 and T2*-weighted MRI) co-localized or in close proximity to the substantia nigra subregion 1 (compatible with pars reticulata). Our brainstem nuclei atlas and connectome can be applied to study brainstem mechanisms in health and in a wide array of brainstem pathologies, such as disorders of consciousness, sleep disorders, Parkinson’s and motor diseases, chronic pain, altered autonomic function, and vestibular disorders. Our team is currently working on the translational application of the brainstem nuclei atlas and connectome to improve our understanding of arousal mechanisms in traumatic coma and its prognostication (collaboration with Dr. Edlow, MGH). We are also investigating arousal and motor mechanisms in REM-sleep behavior disorder, which is a premotor model of Parkinson’s disease, with the goal of developing prodromal (early) brainstem-based imaging biomarkers of Parkinson’s disease (collaboration with Dr. Videnovic, MGH). Our most recent efforts are devoted to map autonomic-vestibular pathways and functional interactions in healthy subjects as a baseline for future studies of vestibular disorders (collaboration with Dr. Indovina, IRCCS Santa Lucia Foundation, and Dr. Staab, Mayo Clinic). fMRI resonance frequency shifts and quantitative susceptibility changes (Bianciardi et al., 2014). During both evoked and spontaneous brain activity, local changes in blood oxygenation in pial and intra-cortical veins lead to minute changes in the magnetic susceptibility and in the MRI magnetic field in the visual cortex that could be captured directly by monitoring the MRI resonance frequency, supplementing information available from conventional fMRI methods that rely on the MRI signal amplitude changes. Top left: Picture of iron filings showing the field lines of a magnetic dipole. Bottom left: Precise mathematical representation of the field lines of a magnetic dipole. Top right: Naturalistic picture of cerebro-vascular arborization. Middle right: Time-course of the magnetic field changes (few nT) in the visual cortex during a block-design visual task that we were able to extract from 7 Tesla phase fMRI signals (Bianciardi et al., Human Brain Mapping 2014). 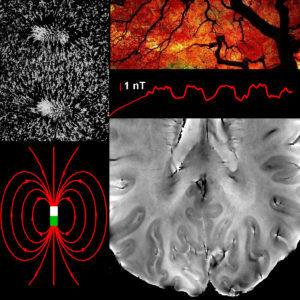 Bottom right: High-resolution (0.31 mm in plane) 7 Tesla gradient-recalled echo phase image showing pial and intra-cortical veins in the visual cortex. We are also interested in developing MRI methods able to: (i) correct for physiological noise in MRI/fMRI data; (ii) extract biomarkers of brain microstructure, physiology, function and metabolism, based on multiple MRI modalities and the acquisition of physiological and electrophysiological recordings. Interestingly, our search for methods to correct for artifacts and noise (aim (i)) sometimes turned out to be an opportunity to observe interesting signals or develop novel biomarkers (aim ii)! This was the case when we were developing methods able to remove fMRI noise related to the magnetic field changes due to respiration: once we found out how to model this type of noise from the phase fMRI signals at each time point, we were astonished to observe significant task-based and resting-state functional responses from the residual (after noise removal) phase fMRI signals (beyond the commonly employed magnitude fMRI signals). Ours was the first paper (Bianciardi et al., Human Brain Mapp 2014) reporting the measurement of task-based and resting-state fMRI resonance frequency shifts and quantitative susceptibility changes, most probably originating from neuronal activity through induced blood volume and oxygenation changes in pial and intracortical veins. Further, our expertise in modeling and correcting for fMRI signal fluctuations due to cardiac and respiratory pulsatility effects allowed us (Bianciardi et al., Phil Trans A 2016) to develop MRI methods able to visualize MRI pulse waveforms due to pulsatility effects in several brain compartments, as well as to develop novel MRI indicators of cerebrovascular compliance (the pulsatility volume index). See the following videos! We deeply thank our funding sources for making this work possible! Copyright © 2019 Brainstem Imaging Laboratory. All Rights Reserved.